Give the gift of peace of mind. 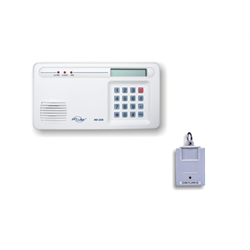 This simple kit provides a fob style panic button and a wireless emergency dialer. The fob can be attached to a key chain or a break-away neck chain. Simply record a message on the dialer, program it with your contact telephone number(s) to call in case of an emergency and connect it to your phone line. When the panic button is pressed, the number(s) will be called and the message will be played to alert co-workers, friends, relatives or care staff that help is needed. The system can be expanded with additional PT-434 or KP-434 panic transmitters up to a maximum of 16 transmitters. * Requires a standard phone line. Not recommended for use with voip or non standard phone systems.